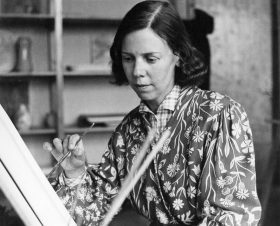 Rut Bryk (1916 – 1999) was a Finnish ceramist, considered a key reformer of modern Finnish ceramic art. Bryk studied at the Art and the Central School of Helsinki in 1936–1939 and started working in 1942 in the Arabia Factory in Helsinki together with Birger Kaipiainen. Bryk’s early works include graphical designs for greeting cards and book covers, as well as ceramic objects, such as colourful containers, trays and jewellery. The subjects were figurative, often naivistic poetic and glowing in color. From the 1960s onwards, she began to carry out works on individual small tiles. Bryk’s most famous pieces are the “City in the Sun” (1975), Helsinki City Hall’s lobby staircase as well as seven paneled wall relief “Ice Flow” (1987–91), displayed in Mäntyniemi, the President of the Republic’s official residence. Bryk was married to designer Tapio Wirkkala.